Cut back on your lunchtime kilojoule intake by following three easy tips. It might seem like the healthy choice, but veggie burgers can be quite fattening. Swop the veggie patty on your burger for a grilled chicken breast and you can cut back on about 920 kilojoules. Choose broth-based soups over creamy ones. 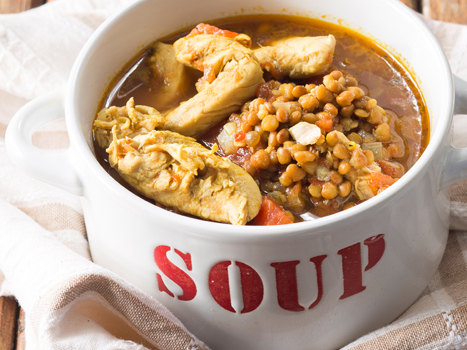 Broth-based vegetable and chicken soup contain just more than half the kilojoule content of creamy chicken soup. Swop the cheddar cheese on your sandwich with non-fat mozzarella. A 28 g slice of cheddar cheese has about 473 kilojoules, non-fat mozzarella can have less than 200.